There has never been a shortage of Star Wars-themed merchandise available to purchase since the first film graced our screens close to forty years ago (Can you believe it? How time flies!). But with the announcement that Disney had bought the Star Wars franchise from George Lucas, and would be releasing a new film at the end of 2015, it seems as though there was a newfound resurgence in products available for avid fans to buy. Toys, books, costumes and other paraphernalia have flooded store shelves, and it isn’t likely that the trend will die out anytime soon. News of the up-and-coming film has also created an increased surge in fan-produced items, and these have been adopted by larger companies who have recognised their popularity. 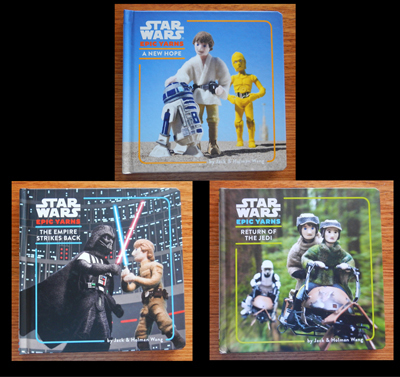 Chronicle Books, an imprint from Hardie Grant books and Random House Publishing, has recently released three books that pay homage to the original trilogy (Parts IV, V and VI). But don’t be fooled into thinking that these are your average, run-of-the-mill science fiction fan books. 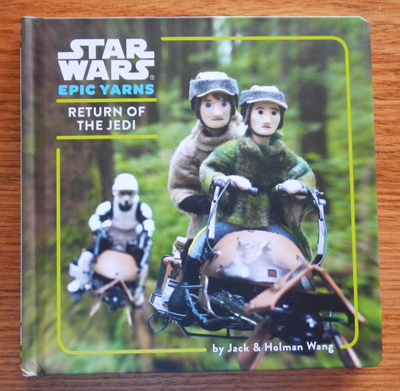 Managing to condense the epic stories into three little board books, the ‘authors’ –Jack and Holman Wang- have produced a very clever and creative fan venture. Choosing twelve of the most iconic and story-progressing scenes from each film, the duo have lovingly recreated each movie still using felted characters and imagery. Using their extremely detailed crafting abilities and skilled photography, they have managed to recreate each picture so that it is completely recognisable. Then, on the adjoining page, they use just one word to describe the scene. Strangely enough, if you have seen the films, and recognise the scene that has been reproduced, this one word has enough context behind it to progress the story. What you end up with is a 2-3 hour film reduced into twelve felted scenes and twelve words, yet this abridged version, your previous knowledge of the films, and your imagination manage to make it work. 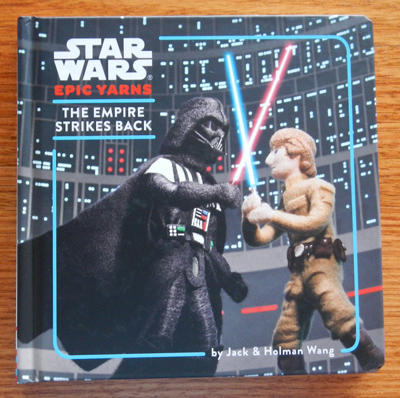 The entire creative (and very labour-intensive) process took the brothers a year to complete, and an account of their work can be found at http://www.starwars.com/news/weaving-star-wars-epic-yarns, if you’re interested in learning more. I’m a huge fan of arts and crafts, and to see felting (a relatively lesser known craft) used in this way- to reproduce some of the most popular films of our time- is exciting to say the least. 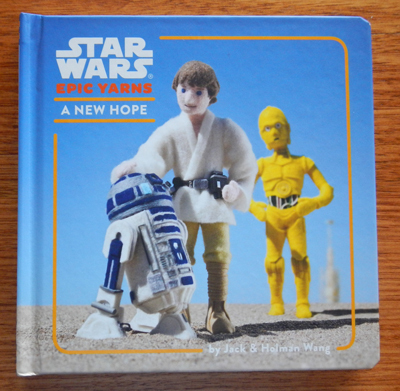 Hopefully the popularity of Star Wars, combined with an interest in different illustration mediums, will bring forth a whole new generation of similar books.